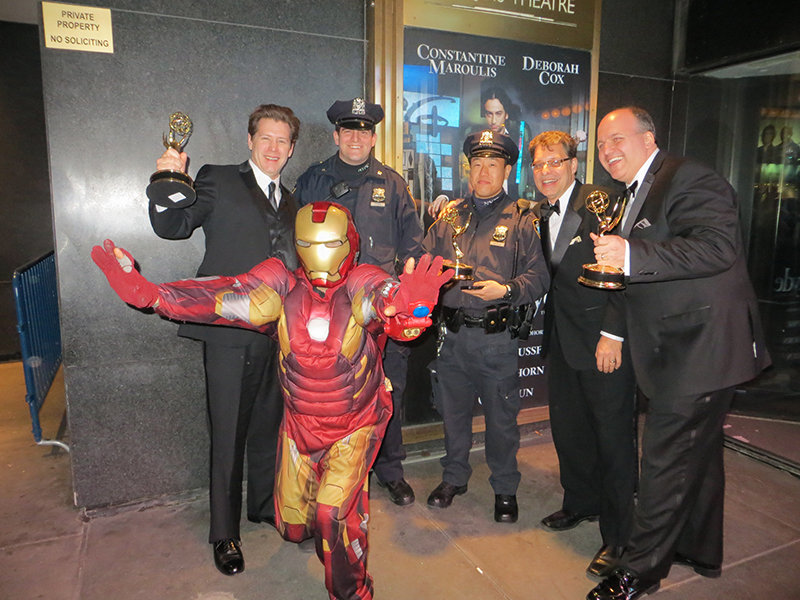 …Signs of the Time for Best Documentary at the 56th Annual New York Emmy® Awards gala held on Sunday, April 14th in New York City. In a night full of glitz and glamour, we settled in to enjoy the evening with hopes running high, but with determination to savor the moment regardless of the outcome. What a thrill it was to then hear our name be called by the presenter, singer/songwriter Judy Collins, in the Documentary category. Caroline Manard, Ray Manard, Don Casper and Jim Hughes walked up to the stage in a bit of a daze to accept the award. Truly it is an honor to see our film be recognized by others in the industry. This film has been a labor of love for everyone involved and this is the icing on the cake. 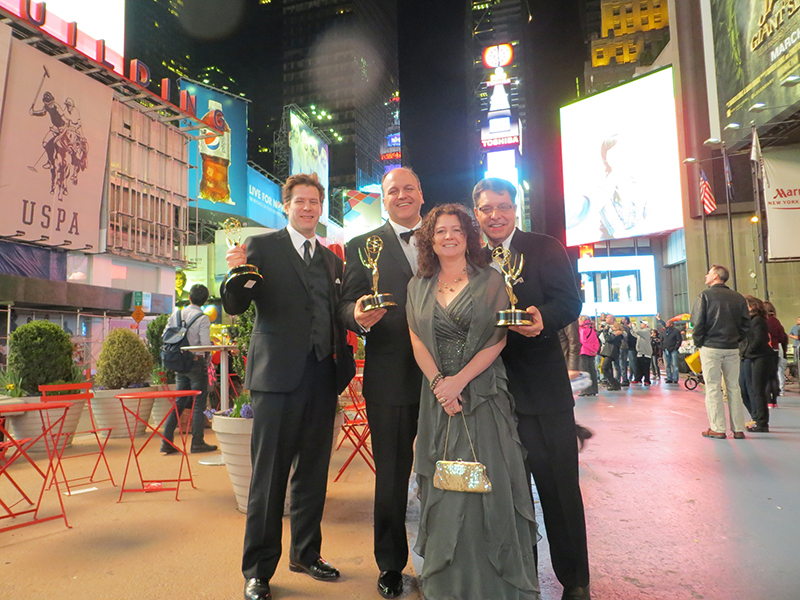 But the excitement of the night did not end there as our film won two more Emmy® Awards. 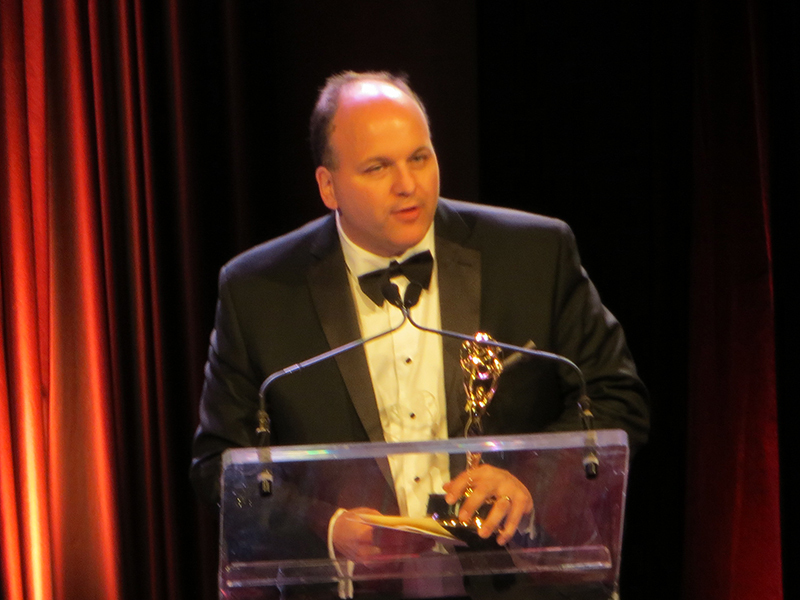 Ray Manard won in the category of Editor: Program and Rob LaVaque won in the category of Musical Composition/Arrangement. 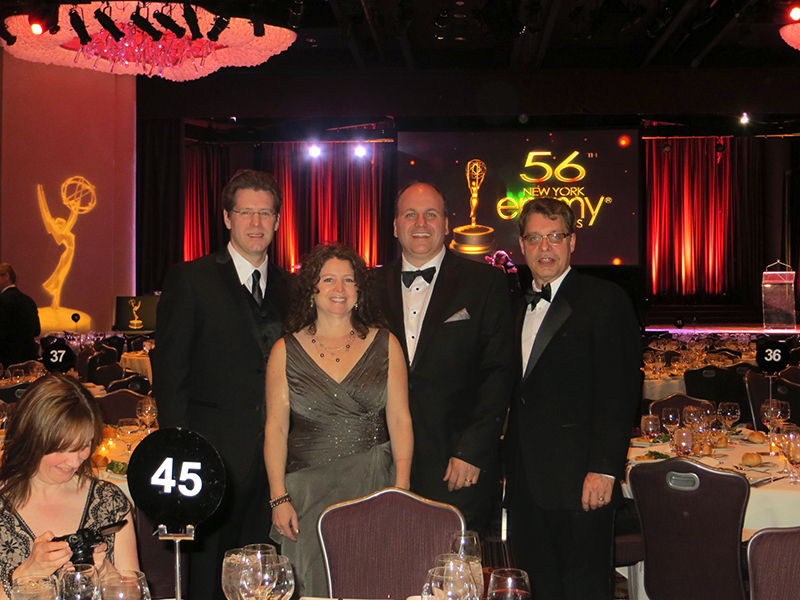 A big congratulations goes out to the entire Crystal Pix, Inc. team for their dedication and hard work, and to our talented partners, including Eric McMaster, Jim Hughes and Rob LaVaque, who joined forces with us to make this film a success. For the past year, Signs of the Time has been airing on public television stations across the US, distributed by American Public Television and presented by WXXI-TV right here in Rochester, NY. Let’s raise a glass! Greg Short at the Grand Rapids venue. I have recently returned from promoting our film at the Grand Rapids Film Festival in, you guessed it, Grand Rapids, Michigan. This was a first year festival so there are some kinks to work out, but overall it was a good experience. One of the things that I enjoy the most about going to film festivals is meeting the other filmmakers. It is always amazing to me how no matter what your budget is or your notoriety, everyone follows a similar path and has similar obstacles to overcome. It’s very reassuring to know that you are not alone in your trials and tribulations. So how were the movies? I enjoy seeing the never-ending stories that there are to be told. I was happy that our film was chosen to play here because this festival focused on the films that promote positive messages and that are family-oriented. Because of this many of the films featured were faith-based. A couple in particular stood out. Click Clack Jack is a short film that is intended for children. It reminded me a lot of an ABC Afterschool Special that I used to watch all the time when I was a kid. Good production value, good moral to the story. We had some interesting conversations with executive producer, Keith Thomas, about his path to becoming a filmmaker from production through distribution. I wish him the best of luck. A film called As We Forgive left the most impression on my heart. It is a documentary about two Rwandan women coming face-to-face with the men who slaughtered their families during the 1994 genocide. This film will make you question your own ability to forgive and show how forgiveness can breath life back into people and their communities. Powerful stuff. Our film had a decent attendance considering it was playing against the headliner film Like Dandelion Dust. Unfortunately, we didn’t get any audience feedback since apparently all the volunteers handing out the ballots appeared to be at the premiere event. Oh well. I guess now it is our turn to forgive.